Minsky's Link between debt and profits shows why nominal levels of credit growth must be maintained, coupled with the end of China's deleveraging cycle, this suggests that bank assets will grow. Net interest margins are likely to remain stable. This suggests overall stable growth outlook for bank earnings. 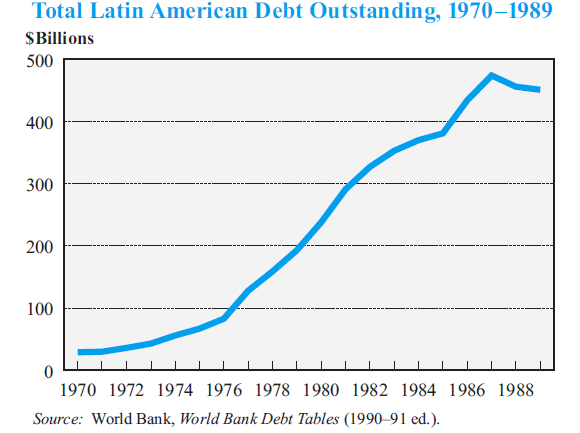 A comparison with US banking crises of the past 4 decades suggests that the bad debt worries are probably overblown. Mouthwatering valuations suggest an investment in Chinese bank stocks may do very well in the future. Western stock analysts routinely question whether the bad debt ratios of Chinese banks are understated and write-off Chinese bank stocks as a shaky investment. 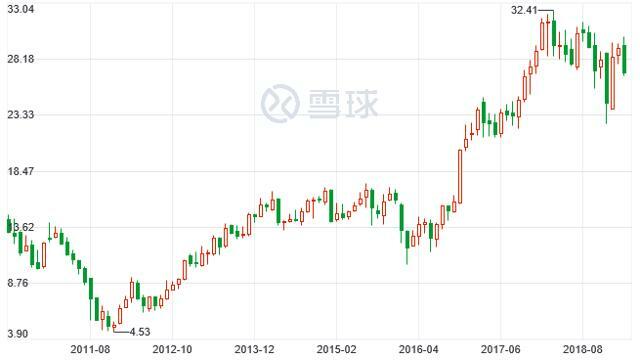 This is undoubtedly a valid question, but I believe that the cyclical bull case for Chinese bank stocks is stronger. To support my analysis, I will draw on the theoretical framework of Hyman Minsky, as well as the performance of US bank stocks since the 1980s. Simply put, if the equation profits=investment provide the baseline amount of profits in the economy, then an increase in debt by the public/private sector that is spent on goods directly leads to an increase in profits. To illustrate this formula in an easily understandable manner, assume a village produces 10 tons of wheat each year at maximum capacity and consumes 1 ton, the household savings are 9 tons per year. Walmart (NYSE:WMT) suddenly comes in and sells trinkets. The village spends 9 tons of wheat per year on the trinkets (to simplify things assume the trinkets have a cost of 0), so the 9 tons wheat of household savings are transformed into 9 tons wheat of corporate profits. Now if the households like the Walmart trinkets so much they are willing to buy trinkets on credit from Walmart, say an additional 5 tons wheat worth of trinkets in one year. Then corporate profits are 14 tons wheat, household savings are negative 5 tons. If the households decide next year to be more frugal and pay down the 5 tons debt, then only 4 tons of trinkets are purchased and corporate profits fall to 4 tons. But if corporate profits are to stay at 14 tons wheat, then households need to take on 5 tons debt each year (unless there is an increase in output of wheat or a devaluation/writeoff of the debt). So theoretically there is a direct link between increase in debt and profit. To evaluate whether this conclusion would hold using real world data, I conducted a regression using corporate profit growth, GDP growth, interest rates and change in leverage levels and found change in leverage levels had a statistically significant impact on corporate profit growth. As most of debt growth in China is funneled through banks, banks' balance sheets are likely to expand as credit expansion restarts. Chinese banks' profits were 2.4% of GDP, whereas US banks' profits were only 0.9% of GDP. As a result, starting in 2013, the government looked for ways to compress bank profit margins, including experimenting with internet finance to compete with traditional banks, which ushered in the rise of Alipay [which Alibaba (BABA) owns 33% of], etc., rose to become far bigger and influential players than Paypal (incidentally, Alipay overtook Paypal to become the world's biggest mobile payment platform in 2013). 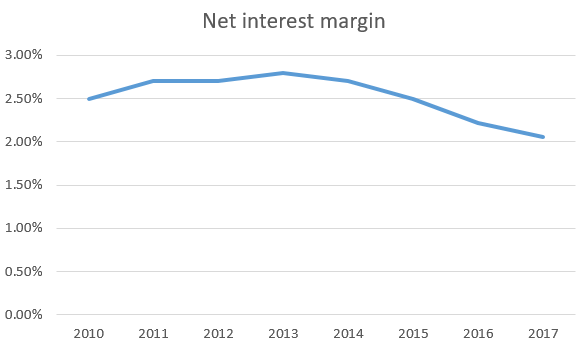 The end result was a significant compression of banks’ net interest margins, falling from a peak of 2.8% in 2013 to barely 2% in 2017. This led to dramatically slower growth in bank profits and a decrease in bank profits as a percentage of GDP. This year however, with large uncertainties from the trade war and the monetary stringency in 2018 looming, economic stability is on the agenda, with “six stabilities” (which include financial stability) being of paramount concern. Bank profit margins are unlikely to be further squeezed and net interest margins have gone from 2.05% in 2017 to 2.18% by 2018Q4. The downfall of two very prominent P2P platforms in recent weeks will probably remind savers to stick with safety rather than chase after yield. As I argued in my previous piece and as is reported through various media channels already, China has declared an end to deleveraging and has moved towards monetary easing. Interest rates have fallen and credit growth has increased. Growth in the interest-generating asset base multiplied by stable net interest margin means stable profits with moderate growth and this provides a moderately positive outlook for the banking industry in the next few years. 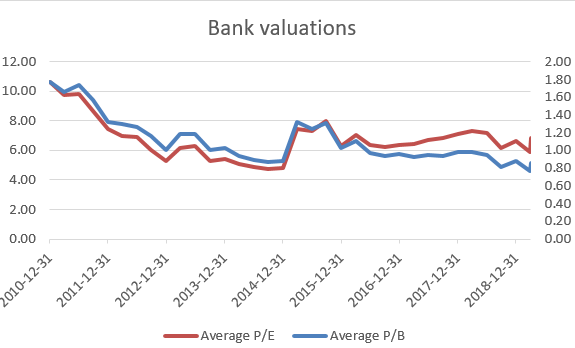 By both P/E and P/B metrics, Chinese banks have very low valuations. Bank valuations for large listed Chinese banks in the mainland A share market are 6-7 P/E and 0.8 P/B on average as of 2019/3/31, with a 10-20% discount for H shares listed in Hong Kong (A shares can't be transformed into H shares directly, and usually trade a premium to H shares). The relatively flat trend in the valuations disguises stock prices that are overall trending higher, as bank earnings grow. Finally, the most pressing issue which concerns most Western analysts, how high is the bad debt ratio in China? My guess is that probably a bit higher than the banks would like to admit, a bit less than the pessimists would assert, but ultimately perhaps not very important. As long as there is no imminent crisis that can cause a run, no threat of contagion, a bank of last resort (i.e. the central bank) with the willingness to provide unlimited liquidity, and limited debt denominated in foreign currency, then a financial crisis might not materialize. 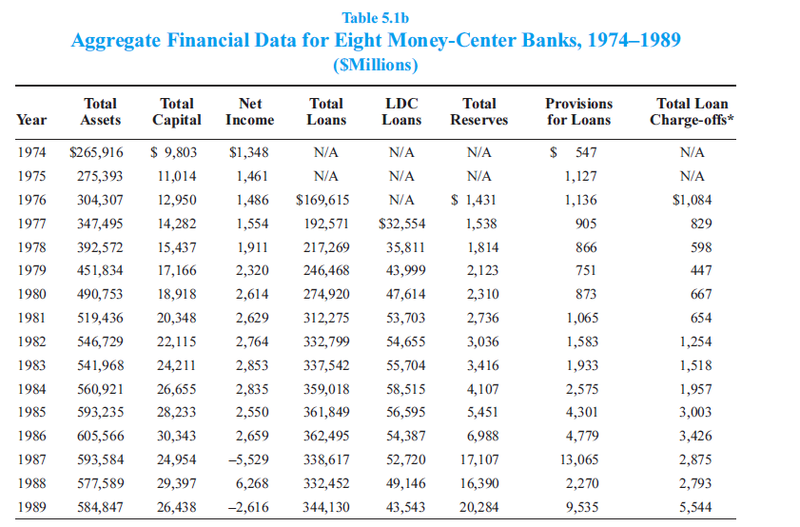 In the 1970s, US banks thought it was a good idea to lend large amounts to lesser developed countries. By 1982, when Mexico defaulted on $80 billion of debt, exposure to LDC loans of 8 large money center banks amounted to 2.5 times total capital and 20 times net income. This appeared to be a hole that banks could not dig themselves out of. Yet interestingly, Citigroup's stock price began a strong rally starting in 1982 and ending in the late 80s. 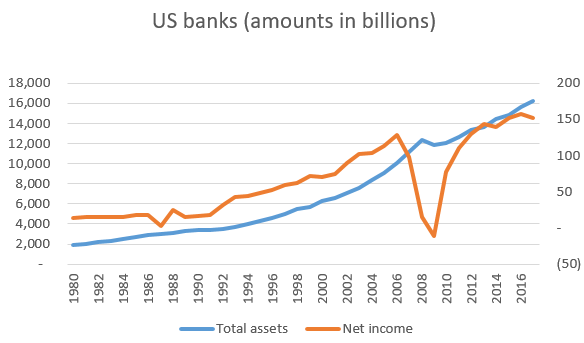 What made the 2008 crisis so bad was the interconnectedness of the financial system that was highly leveraged, with hundreds of billions were financed based on repos (with very short liquidities) to be invested in shaky long-term assets, and with everyone somehow being ok with this. Domino after domino fell and asset prices plunged in a death spiral. Investors and institutions alike flocked from companies they thought were failing (like Lehman and finally even AIG). The uncertainty of who was next made things more tense. Ultimately, US policymakers figured out how to de-escalate the crisis. It was not a popular solution, it was often misunderstood and perhaps it benefited some more than others. Fair value, mark to market accounting was temporarily suspended, unlimited liquidity was given to banks to prevent a run from happening at any one bank. Slowly, fears of the financial crisis getting worse abated, buying time for the economic system to heal itself. 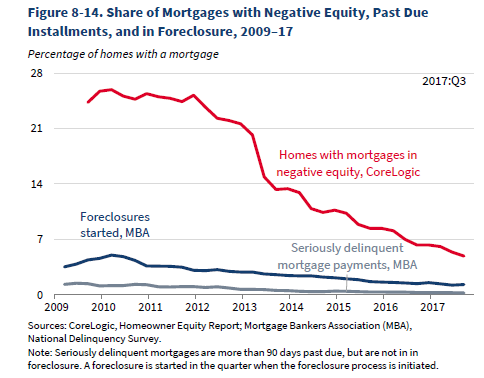 In 2010, almost a quarter of homes with mortgages had negative equity, by late 2017, only 5%. How bad was the bad debt problem in 2008? According to the Fed Flow of Funds accounts, with $5 trillion in mortgages, GSE bonds, and consumer credit on banks' balances sheets in 2008 (out of a total of $14 trillion in assets) and over a quarter of homes with negative equity, the bad debt issue was very serious indeed. As the US experience shows in the 1980s and after the 2008 financial crisis, however big the bad debt problem, it was eventually inflated away and banks earned back their equity in a low interest rate environment. China is in a similar situation. I would argue that at a P/E ratio of 6-7 and P/B ratio of 0.7-0.8, the risks are already priced in and any financial crisis is unlikely to happen in the foreseeable future. In the meantime, a persistent, credible return of cash to investors through dividends, will eventually convince investors to reach for that yield and drive prices upwards. 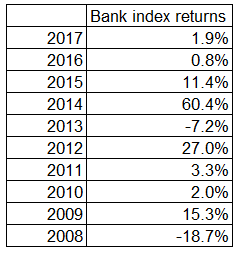 If we look at the past performance of the Chinese bank stocks index, we can observe that most of the gains are concentrated in one year or even a few quarters every few years. So an investment in Chinese bank stocks could go nowhere for quite some time and then pleasantly surprise investors in one year, but this may take an uncertain amount of time. However, one risk is that bank net interest margins are further compressed by government policy or foreign banks entering the Chinese market on a bigger scale as a part of a trade war deal or due to other reasons. Another risk is of course, potential economic downturn. Additional disclosure: I hold large holdings in Chinese equities that do not have a ticker code on seeking alpha.